Monday night soccer. Perhaps a bold experiment by ESPN to give MLS the incredible ratings boost that comes with having a quality lead in — like collegiate arm wrestling. Or perhaps so ESPN could air a meaningless European friendly on Sunday — since, after all, American soccer fans are a fickle and disloyal bunch. For whatever reason the LA Galaxy found themselves playing one of the most important games of the season against league leaders, the Seattle Sounders, on a Monday night. 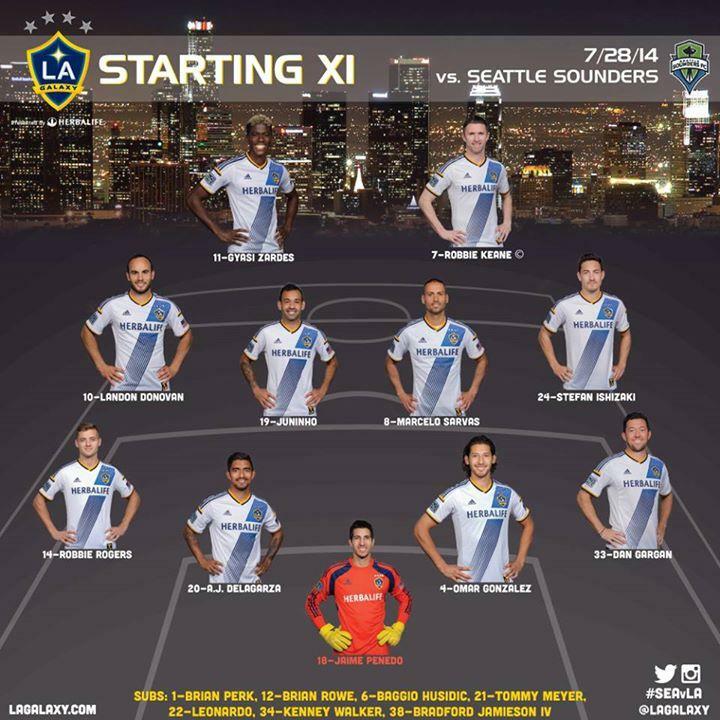 And much to the delight of Galaxy fans, LA completely demolished Seattle to the tune of 3-0. 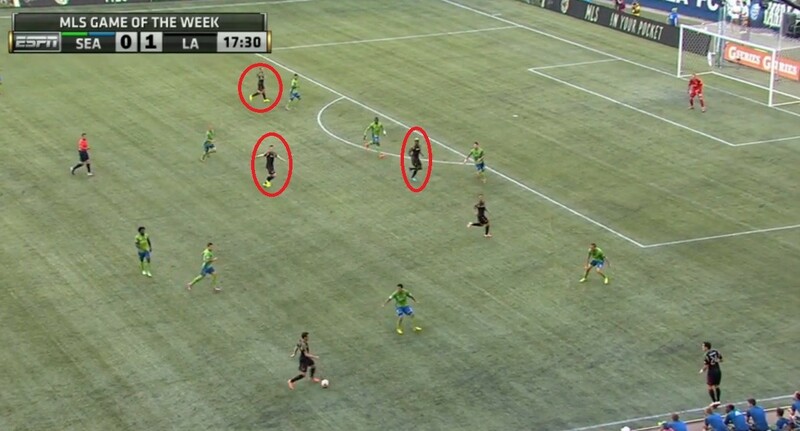 …with a flat 4-4-2 with LA’s 3 speedsters all lining up on the left hand side — but more on that later. For now, I’d like to focus on Bruce’s brilliant tactical use of the Sarvas/Juninho tandem, and the stellar play of Marcelo Sarvas as a whole. 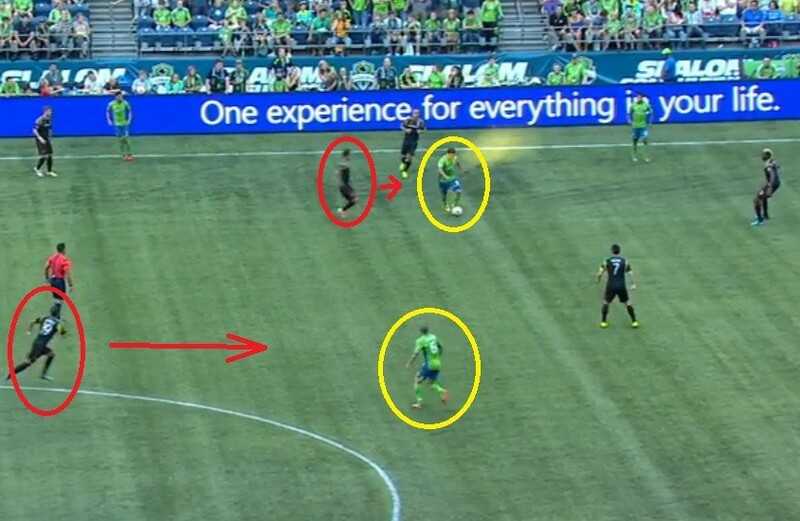 Some people have dubbed the Seattle midfield the amoeba, for its fluid movement. Others have dubbed it the Hydra, for its multiple heads of attack. 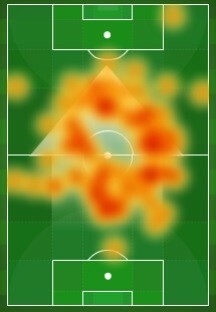 Whatever you want to call it, the LA Galaxy completely smothered it throughout the first half. 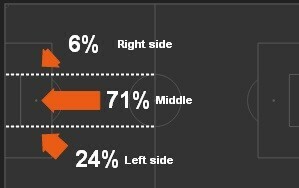 The general plan seemed to be as follows: The back line was to push up as little as possible, respecting the counter attacking prowess of Obafemi Martins. 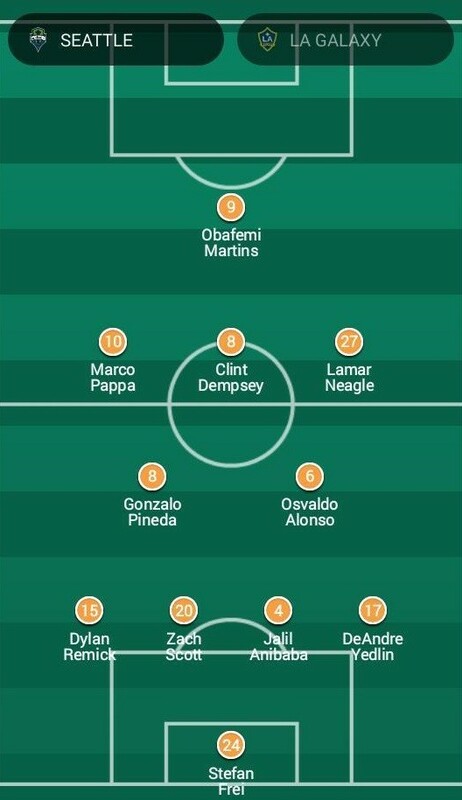 Sarvas and Juninho dropped back with them, so as not to leave a major gap between the backline and midfield — the sort of gap Clint Dempsey likes to operate in. 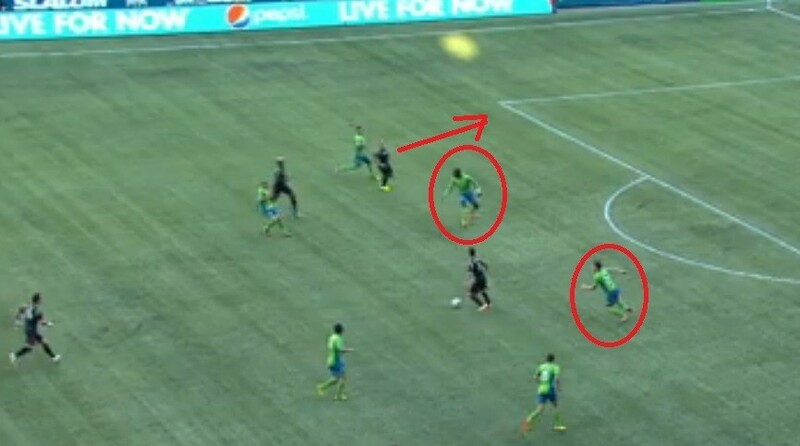 The game plan was to smother the Seattle attacking 3 under Martins, giving Alonso and Pineda all kinds of room to operate in their own half. Apart from a single through-ball from the pair, the strategy was a success. 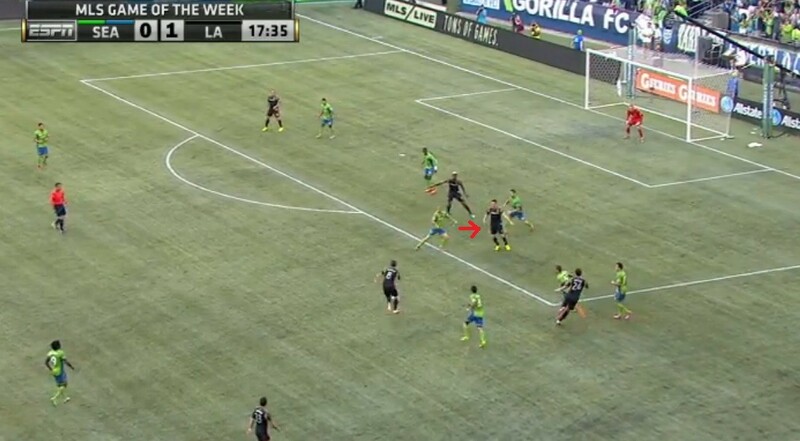 Having Omar Gonzalez back to deal with any aerial, ambitious lobs forward definitely helped. When the LA Galaxy did find their back line up the field, the high press was on from Juninho and Sarvas in order to stifle any counters before they could begin. When Sarvas was able to connect with Donovan on that left hand side, however, good things happened. 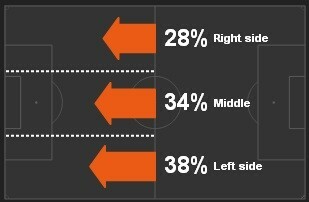 Sarvas continually made surging runs into the attack, and was one of the primary chance creators on the night. He was also central to ball distribution. He had an 11% pass usage (percentage of teams passes), coming in behind only Landon Donovan (at 11.4%) and Robbie Rogers (at 13.5%). 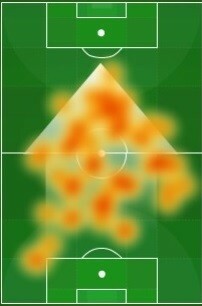 At this point you’re probably wondering: how did our left back end up with the most passes of any LA Galaxy player? 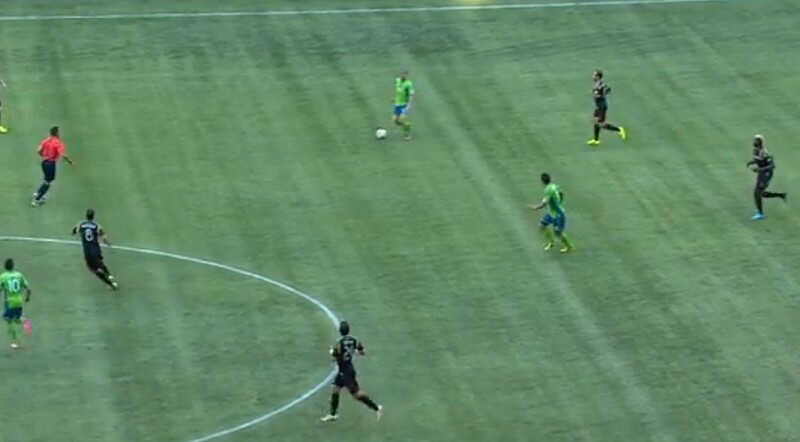 On Monday the Galaxy took Seattle to task down that left hand side — and this, too, was a brilliant bit of strategy from Bruce. For most of the year the LA Galaxy have been been far too narrow, struggling against teams that have two solid defensive mids. With Pineda and Alonso, Seattle is just such a team. On the offensive side of the ball the game plan was simple. 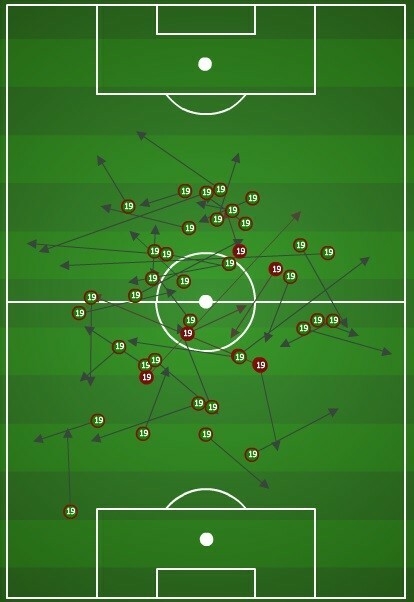 Whenever the ball reached the feet of Juninho or Sarvas, it would be quickly played back out to one of the wings (refer back to previous passing charts). This little scheme let LA bypass Pineda and Alonso, whose turnovers Seattle’s offense relies on as a springboard for their attack. The beauty of playing Donovan on the left hand side is that Landon is a very good inverted winger, and with Robbie Keane tending to ghost out of traditional forward positioning, Landon had plenty of chances to rotate into a striker-like role. 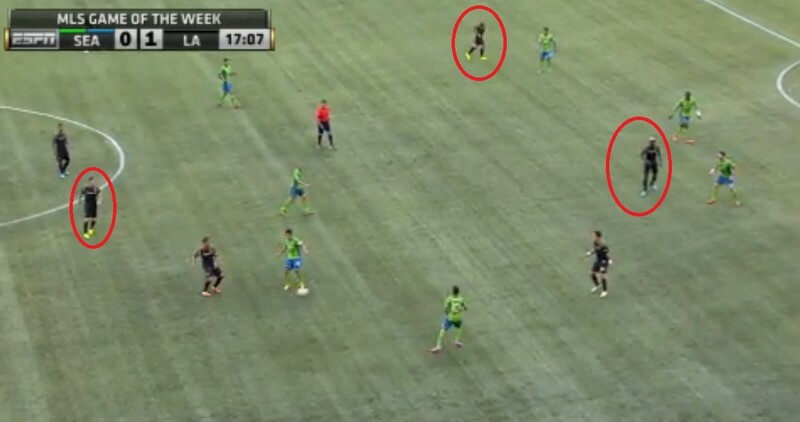 In a matter of 30 seconds Keane goes from extremely deep in the midfield, to a position where it is conceivable that Donovan could back off and Keane could move back to his forward position. And finally, in the last image, Keane floats in to that happy space between the midfield and backline, where strikers like him are so dangerous. At this point Donovan, Zardes and Sarvas are all making dangerous runs. Keane is eventually able to confuse Alonso enough to allow Sarvas to get off a shot, which Donovan eventually rebounds. So is this formation the answer to the Galaxy’s troubles going forward? 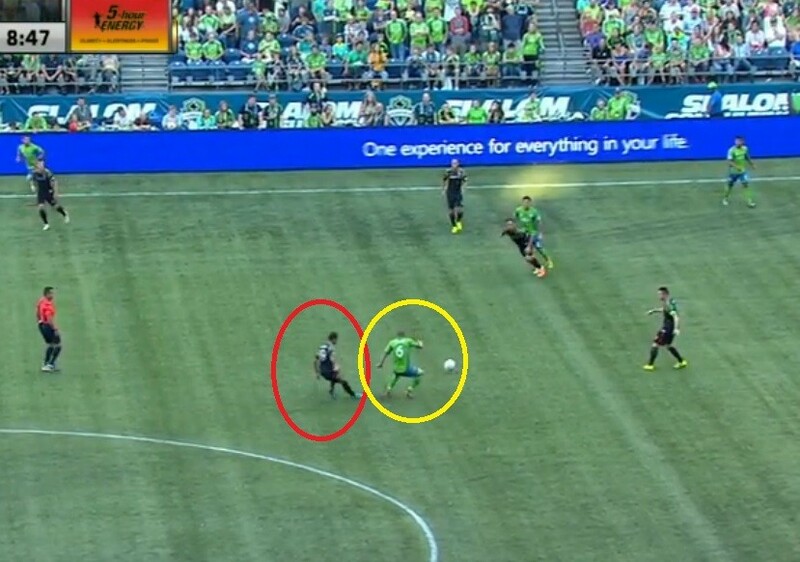 While the formation definitely shows a lot of promise, there is also good reason to be skeptical — mainly, Seattle’s defending was atrocious. In this screencap we see that the MVP of this article, Marcelo Sarvas, has the ball. Jalil Anibaba makes the regretable decision to step towards Sarvas, allowing Donovan to run behind. Sarvas plays the ball to Donovan — Donovan passes to Zardes, and Zardes scores. 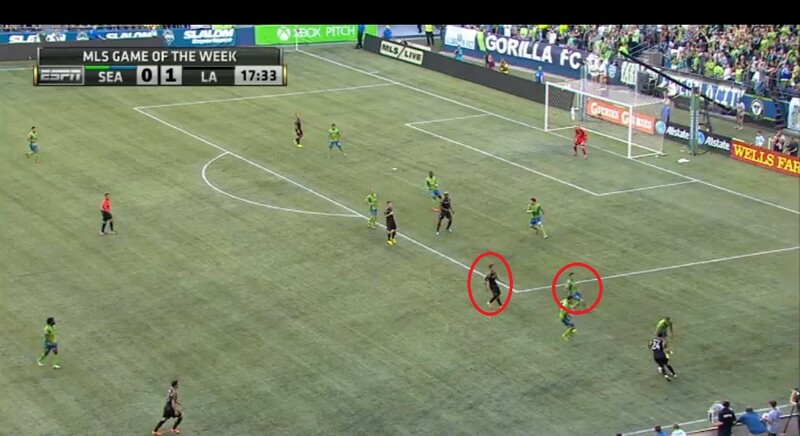 But Zach Scott is truly to blame for this goal, for a decision he made seconds earlier. 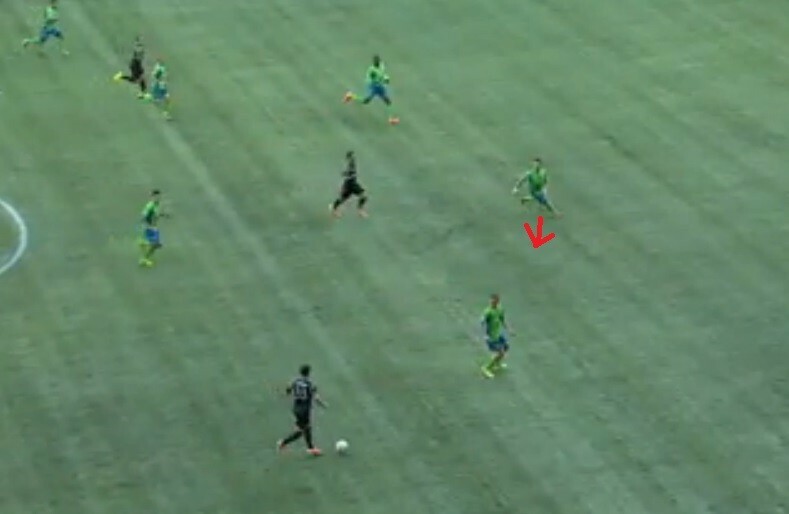 Dan Gargan had the ball on the right side and was clearly about to pass. For reasons which are entirely unclear to me, Zach Scott – who is marking Sarvas – reacts to this motion by stepping towards Gargan. You can clearly see Anibaba eyeing Sarvas’ run. He is forced into a quick decision and happens to make the wrong one. Had Zach Scott stuck with his man, he wouldn’t have had to make it in the first place. 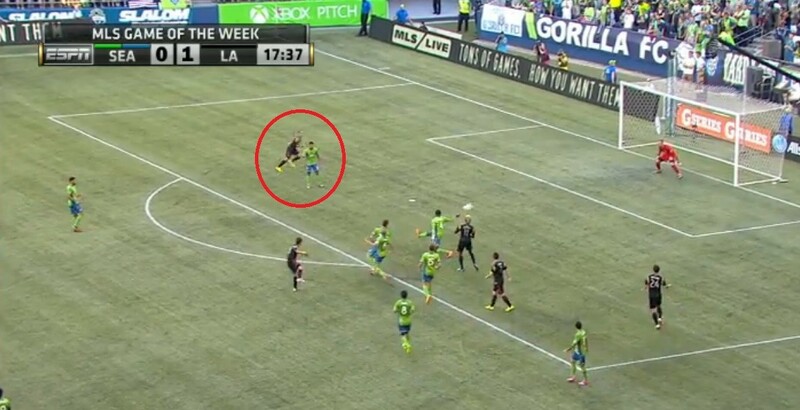 The second Galaxy goal can only be described as a comedy of errors for Seattle’s defense. To start the play, Marco Papa runs right by Marcelo Sarvas, or perhaps doesn’t even recognize him as his mark in the first place. Sarvas receives the ball, completely unmarked by Papa, leaving Ozzie Alonso to clean up the mess. Instead, Alonso steps towards Keane. 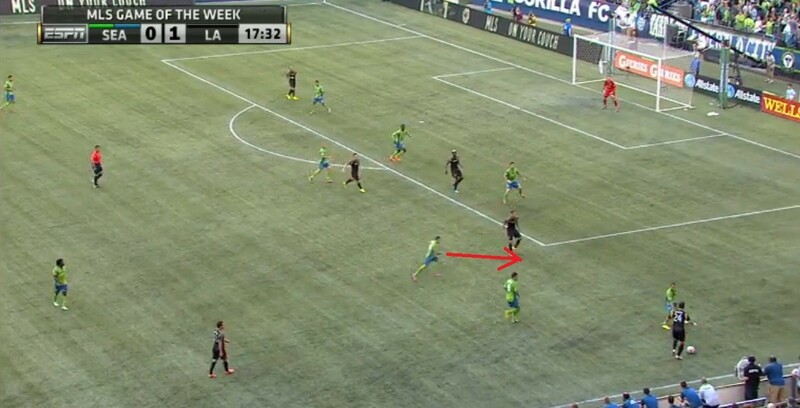 Finally, Deandre Yedlin is caught napping on the far post instead of following the shot. The reason I highlight these mistakes is to underline the fact that the high-flying nature of Monday night’s performance must be taken with a grain of salt, considering the shambolic defending LA was up against. A truer test may come Saturday against the Portland Timbers, who look to be finally figuring things out. I fully expect to see this same lineup on Saturday — I’m just not convinced we’ll see the same blowout.